Specialized Saddles Eurolight Brown with Turqoise Seat, 3/4 Floral Tooling. Specialized Saddles are custom built to your personalized order. All saddle models feature our patented 3D adjustable fitting system which allows you precisely fit your horse. A horses’ back is three dimensional and all three dimensions must be considered to achieve perfect fit. The Specialized Saddles patented adjustable fit system is the only saddle fitting system that allows you to independently adjust your saddle for all three dimensions of saddle fit, width, arch and angle. Horses, much like people, can be somewhat asymmetrical (one shoulder larger than the other), and the fit system can be independently adjusted for each side of your horse giving you the absolute best fit possible! Specialized Saddles are exclusively handcrafted in the USA with premium quality grade 1 English Bridle leather from the #1 and oldest tannery in the United States. English Bridle is Labor-intensive and incredibly appealing. It has been traditionally used for classic equestrian gear all the way to high-end leather goods. English Bridle is smooth and supple yet very durable and has a flawless even surface. Saddles built with skirting leather (most commonly used in the saddle industry) require weeks to break in and can have the “new saddle squeak” for years. Built with English bridle leather, our saddles require no break in time and are ready to ride right out of the box. A perfect example of “riding a Specialized Saddle right out of the box” is when long time Specialized Saddle rider Sue Hedgecock purchased a new saddle that was shipped directly to the Western States One Day 100 mile Tevis Cup Endurance Ride. 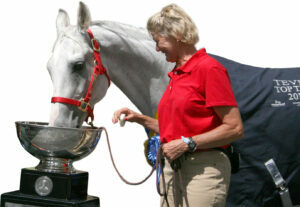 Sue took the saddle out of the box, put it on her Julio, rode 100 miles and won the Haggin Cup Best Condition award. English bridle leather is another example of comfort and value you won’t find in any other saddle! Specialized Saddles seats are made of supple flawless sides of Sonoma leather and are padded with the ultimate in comfort, long lasting closed cell foam. Depending on your riding style you can choose our flat seat if you post or our trail seat if you ride a gaited horse or do not do much posting. 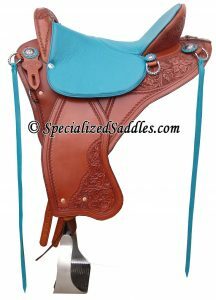 You can choose every part of your saddle from the saddle leather color to seat leather color and finish your saddle up with custom touches like adding tooling and conchos to make it unique, beautiful and truly your own! Not sure what colors and toolings you want? Order your samples here. A. Shown is a Specialized Saddles fitting cushion. 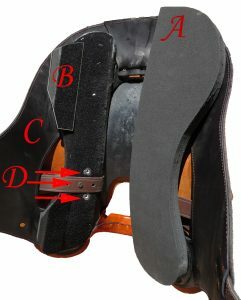 The fitting cushions come in 3 sizes and are used to adjust the width of the saddle. They can be easily changed to accommodate different shaped horses. The fitting cushions are made of neoprene and attach to the bars of the saddle with industrial strength hook and loop material. B. Shown is a Specialized Saddles wedge shim (fitting insert). The wedge shims come in 3 different sizes and are used to adjust the arch for horses with more dip in their back and angle. They are removable and can be easily changed for different horses. They are made of neoprene and attach to the saddle with industrial strength hook and loop material and fit between the fitting cushions and bars of the saddle. C. Specialized Saddles are lined with premium oil tan leather. Oil tan is sweat and water resistant leather and it keeps your saddle looking great for years. As an optional upgrade you can have your fenders lined and reinforced with this same leather to lengthen the longevity of them. D. Specialized Saddles all feature three adjustable stirrup positions. Different types of riding styles call for different leg positions to achieve COMFORT, BALANCE and OPTIMUM PERFORMANCE. Your leg position can be changed between forward, balanced, or centered, by moving a single screw.